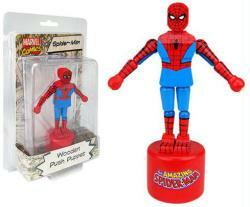 This is a Wooden Push Puppet of Spider-Man from the Marvel Comics series of push puppets. This licensed push puppet (a.k.a. "thumb toy") measures approximately 5" from the bottom of its base to the top of Spider-Man's head. It was produced by Bif Bang Pow! and Entertainment Earth in 2017 and remains new and sealed in its original NEAR MINT packaging.